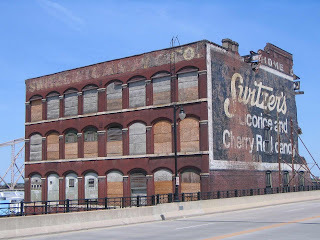 Beginning at 10pm tomorrow night the 133 year old Switzer Building will be demolished. 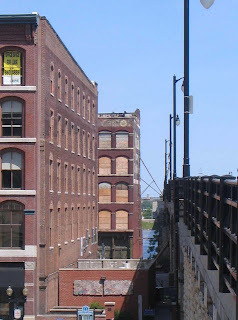 The Eads Bridge is scheduled to be closed for several days, but given the building's current state, it will likely not take that long for it to come down. Unfortunately what doomed the building was not just the major storm damage that occurred last July, which brought down much of the east and a portion of the south wall of the building. The owners who were dedicated to preserving the building were planning to re-build even after such a catastrophic event. The National Park Service however deemed that after the storm, there was not enough of the building left to be eligible for tax credits. Without the tax credits, the economics of re-building became unfeasible. While this is somewhat of an extreme case of the condition to which a historic building can deteriorate, it illustrates how important the tax credits can be in determining if a building is preserved or demolished. Today I went down and shot several dozen photos on the building on it's last day including the ones below. It has been reported that the the owners intend to preserve the small attached buildings just north of the Switzer... if they are not crushed by the wall towering above them. There is also talk that the owners will be keeping the cast iron storefront as well as what limestone trim that can be salvaged, and that they have not ruled out the possibility of rebuilding a replica of the building, or possibly a shorter version. I applaud your efforts. Save and rebuild all you can. You will be a good example for others. 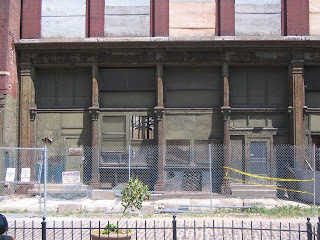 Any plans to rebuild a replica of the Switzer building? I'm sorry to see this one has gone. Thirty years ago when we were trying to get it on the National Register I was amazed that it remained so redolent of the odor of licorice. The essential oils must have soaked into the wood timbers; even though abandoned, dusty and disheveled, the odor of licorice would lift you off your feet. It was a beautiful place.